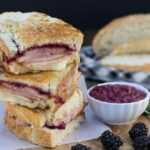 A ham and fontina cheese Panini slathered with mustard flavored with blackberries and rosemary is a wonderful twist on a traditional ham and cheese sandwich. A few weeks ago one of my friends brought us a Honey Baked Ham. We used to eat Honey Baked Hams all the time when I was younger and I just love the crunchy sweet coating of honey that frames each slice. I had some ham leftover and I wanted to make some sandwiches, but not just any sandwich. I wanted something different. For cheese I picked Fontina because I love how rich and creamy it is when melted. I had some blackberries that were dangerously close to turning into a fuzzy science project so I decided to make a blackberry mustard. I wanted to use a herb for more flavor and I chose Rosemary which next to sage is my favorite herb to use during the wintry months. The result was a hearty and delicious sandwich that is great by itself or paired with a bowl of soup. And with the gorgeous color of the mustard, it looks really pretty too. 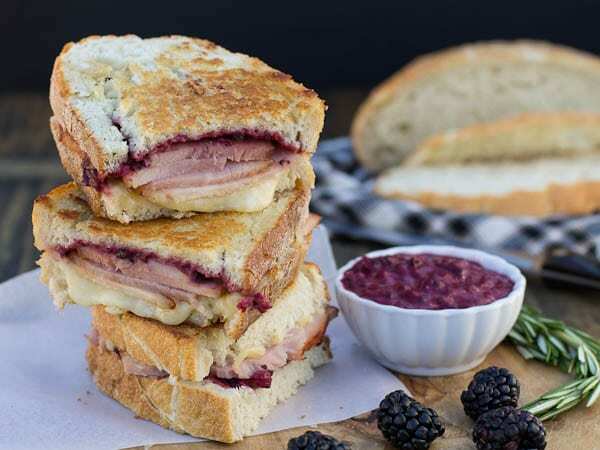 Ham and Fontina Panini with a Blackberry Mustard. To make Blackberry Mustard, combine blackberries, Dijon mustard, sugar, honey, rosemary, and cayenne in a small saucepan. Cook over medium heat, stirring and mashing blackberries with the back of a spoon, until mixture comes to a boil. In a small bowl, mix together vinegar and cornstarch. Add to blackberry mixture. Stir to combine. Let mixture simmer for about 30 seconds and remove from heat. Spread some butter on 1 side of each piece of bread. 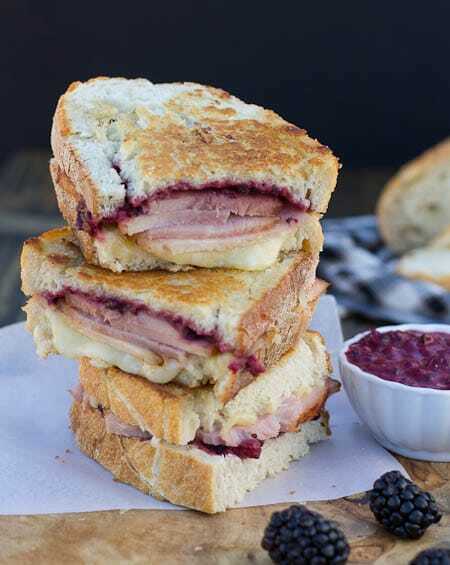 Spread the other side of 4 pieces of bread with blackberry mustard. Divide the shredded cheese on the non-buttered side of the remaining slices. Top with ham and the blackberry mustard coated slices. Heat a Panini grill and grill sandwiches one at a time until cheese is melted. Alternately you can use a griddle or nonstick skillet. This entry was posted in Sandwiches and Wraps and tagged blackberry, ham, panini. Bookmark the permalink. This looks amazing! How long can we keep the Jam mustard for? Ham and cheese is the best sandwich! especially when the cheese is melty 🙂 I love the addition of balsamic and rosemary here…mmmm! Saw this on Tasteologie and couldn’t get my mind off it so I called my husband running errands and asked him for the goods – it was amazing!!!! So glad you enjoyed it Hanna! Hope you have a wonderful weekend! I always associate Honey Baked Hams with beach trips Aunt Jean! I think that was the only time we ever had them! So great! I love your blackberry mustard! Blackberry mustard is a fabulous creation! This panini looks delicious, and fontina cheese sounds perfect for that salty ham. Thanks Marcie and Happy New Year! The blackberry mustard sounds incredible. And spread over a layer of ham and fontina cheese sounds like the perfect sandwich to me. Happy New Year, Christin! What a great combo of flavors here, love the sound of this panini. Happy New Year to you and your family Christin. Thank you Kelly! Happy New Year to you and your family too! What a truly awesome combo! This looks like one gorgeous panini that I’d looooove to eat ;–) Pinned! Thank you Consuelo! Happy New Year! Brie cheese and sour cherry jelly sounds extra yum! Happy New Year Cailee! This would be great with Gruyere (my all time fav cheese )! Yes, it would be great with Gruyere! I love it too! Lovley Combo Christin with the blackberries and ham.. I never have any clue what to do with ham so I bet this was a lovely treat! Happy New Year.. Thanks Shundara! Happy New Year! This looks so tasty!! My mom is cooking ham as we speak and I am dying a little on the inside. I hope you have a Happy New Year Christin!! Seriously. Ham and cheese makes my heart beat faster. 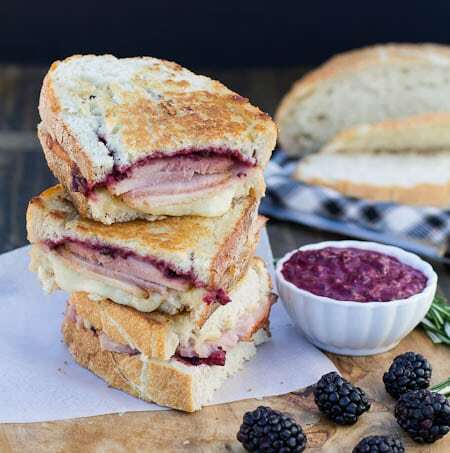 Such a classic combo made even better with this blackberry mustard! It’s getting to be lunch time around here, and I’m even more hungry after reading your post! Thank you for sharing!